Join us on this new Walk in Italys most beautiful and undiscovered southern region, combining fresh air and open skies with history, elegance, fabulous food and delicious wine. We hike quiet trails through olive groves and vineyards and visit two UNESCO World Heritage Sites as well as picturesque seaside towns. See the famous trulli houses and spend two days in the town of Matera, whose inhabitants lived in caves carved out of a limestone promontory cut in two by a spectacular ravine. Of course it wouldn't be Italy without good food and wine and Puglia is home to some of Italys most interesting cuisine, from fresh seafood to an opulent array of antipasti. No reviews yet for this trip. Browse other reviews below for The Wayfarers. Rendezvous at Bari airport for a transfer to our hotel in Lecce. We take a short tour of Lecce, named the Florence of the South for its magnificent baroque architecture. In the evening we meet for our Welcome Dinner and Introductory Talk. Transfer to Otranto and a walking tour of this fascinating coastal settlement dating back to the Classical era, including the Ancient Roman Torre del Serpe watchtower. After lunch we visit La Cutura Botanic Garden containing an abundant collection of succulent plants that thrive in the clement climate. Transfer from Lecce towards Locorotondo and a stop on the way in Ostuni, known as La Citta Bianca, the White City, due to its whitewashed buildings and city walls. We start our Walk close to Ceglie Messapico along the recently restored water conduit of the Sele River. This huge project was started in 1906 to bring fresh water to arid Puglia. We take lunch in Locorotondo, one of the most beautiful villages in Italy. We spend the day exploring Alberobello, a UNESCO World Heritage site, famous for its 1,500 trulli houses. 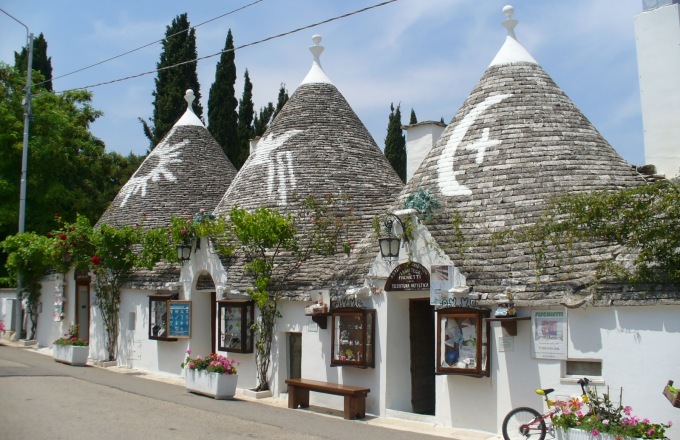 Trulli are built of dry stones (no mortar) with pyramidal, domed or conical roofs. Our lunch is served in a local farm dating back to the Middle Ages. Here we see a cheese making demonstration. After lunch we continue our tour of Alberobello. We transfer to Sassi di Matera in Basilicata, famous for its subterranean houses and our second World Heritage Site. Many of the dwellings are little more than caves and some have been inhabited for 9,000 years. The town has been used many times as a movie location, including Mel Gibsons The Passion of the Christ. We take lunch in town and continue our exploration of this fascinating area in the afternoon. Our Walk starts from the hotel and take us to Montescaglioso in the Regional Park of the Rupestrian Rock Churches of Matera. These unique ancient cave churches are scattered over area of about 8,000 hectares encompassing a wealth of Neolithic settlements, fortified farms, and cisterns. After a day spent exploring this varied terrain, we return to our hotel for our Farewell Dinner. The Wayfarers transfer you to Bari airport and see you on your way.